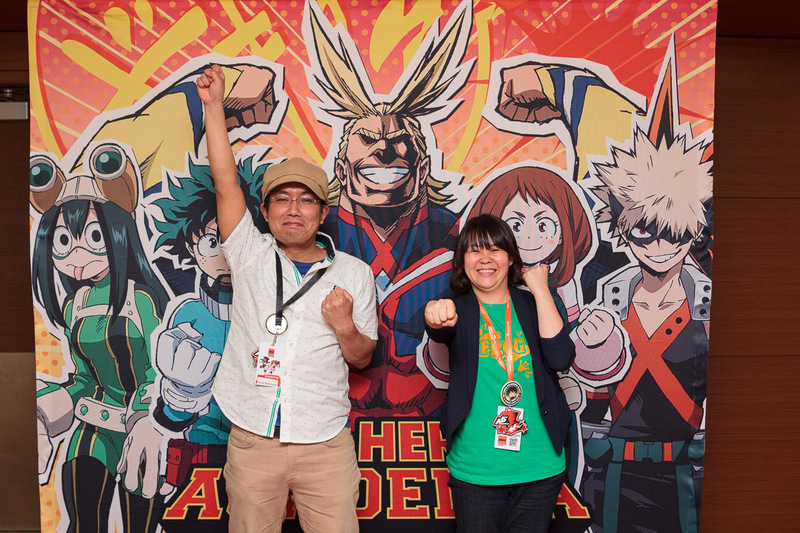 Anime Diet had the privilege of interviewing the director and producer of the current anime version of My Hero Academia, Kenji Nagasaki and Wakana Okamura, at Anime Expo 2016. This was an extensive discussion of the inspirations and process behind the creation of the hit show. Jeremy Booth conducted the interview. This interview was translated by Nami Kodama, and was edited for clarity and concision by Michael Huang. Photos and video subtitles by Lily Huang. How did you get your start in the anime business and what is your most memorable moment as an aspiring young worker in the anime field? Nagasaki:When I first saw the movie “Castle in the Sky (Tenkū no Shiro Rapyuta) ” by Studio Ghibli, I hadn’t watched an anime until then. The film inspired me very much and showed me the possibilities for artistic expression in anime, and led me to join the industry. I started by working for “MADHOUSE Inc” [even though] it didn’t make that film! Do you have any other influencer besides Hayao Miyazaki that you would like to tell about? Nagasaki:Another director I was inspired and influenced by is Kon Satoshi, who was at Madhouse at the time. When I first saw Perfect Blue I thought that he told the story almost like a live action film. But, at the same time, the anime actually does add extra expression than live action, so I really enjoyed working on that at Madhouse. When you were a child, did you ever dream about a superhero? If so who? Nagasaki: I grew up with reading “Dragonball”. So, every week when “Shonen Jump” came out, I rushed to a store to buy it. Goku was my hero. Everybody liked Goku at the time. Okamura: Usagi-chan, the main character of Sailor Moon, was my hero. Generally speaking back then, boys liked , and girls liked Sailor Moon. We (girls including myself) used to play with popular toys like stickers. What was the most challenging part of adapting this anime from the manga? Nagasaki: The original story is very passionate. So, we really paid close attention to capturing the original story’s worldview, using sound and music [as well as drawing]. This is probably the most difficult part of interpreting from the manga to the anime. I worked hard on it from start to finish. Okamura: The main focus was trying to keep the fans happy, because they have strong followings. So, that was probably the most challenging part, by using art and music (as the director just mentioned) attractive as anime. Bringing that special essence into the anime was challenging. But also, at the same time, we wanted to reach beyond the fan base and gain more fans to make them happy. That was probably [another] challenging part. How closely did Kohei Horikoshi, the manga creator, work with the project? Nagasaki: Basically he left us in charge of that. He extended help where we needed some extra background/setting art and/or specific characters that we asked him to help us on. Okamura: Horikoshi was very excited about the anime and was supportive. One of the reasons why he did was that Nagasaki was director and that it was being done by Studio Bones. So, he was very excited and often tweeted about special episodes and more about the anime; he was personally and emotionally involved. There is a clear message of never giving up in My Hero Academia. However, is there any else that you hope fans take away from the show? Nagasaki: The story is not only about how Deku tries to “not give up”. Through the relationship between All-Might and Deku, I hope that the fans would get the sense that though Deku did not have any powers, he became responsible while growing up. I want fans to see that Deku works hard toward his goals and be encouraged by his example. Okamura: Nagasaki’s eyes were glued on Deku’s growth. Was All-Might’s character based on any other real person or American superhero already in existence? Nagasaki: Probably only the original author knows. Okamura: Horikoshi is really a big fan of American animation. He often refers to the American animation in his drawing, so he took some of the essence of American animation to create All-Might. If you were able to have a Quirk, what would it be? Nagasaki: I’d like to fly. Who would you like to see All Might face off in a fight? Nagasaki: The Hulk. I would think (hope) that All Might probably wins. Okamura: I would like to see that All Might involved in something like the Marvel Civil War. Do you have any routines in your creative process/good-luck habits? Could you share any stories, if any? Nagasaki: In the process, when I read scripts I am always consciously thinking about music, about where would I put certain types of music in to fit the scene–and how much and how long to make the anime sharper. This is what I am always thinking about. Okamura: Each director has own way to create a work. Nagasaki is probably the best director, among the ones I know, who consciously thinks about music. He always has his vision from the beginning. As a producer, when I look at the story I decide which stories are well-suited when turning into the anime. As a process I always look at the attractiveness of the character. The most important thing I care about is that the anime can be better than the original manga. This is the essential process that I am always thinking about….I never want to let the audience down by giving them that negative impression: “the manga was so much better, the anime was really boring.” It’s not always the case that the same style from the original manga can work well in an anime. Anime and manga each have their own best way to depict stories. How did you become aware of My Hero Academia when you decided that I really wanted to do this? Okamura: When I first saw the first chapter (I didn’t even know how the story was going to turn out), I was instinctively sure that this could be a great anime. The first chapter was enough to feel that way, because that chapter told me that the story was great. Deku met All Might and then the story began to illustrate how Deku works hard to achieve his goals. That first chapter touched me, and I felt that the story had a very strong emotional power and would impress not only children but also adults. The story further introduced many characters who support Deku. As I said earlier, the attractiveness of characters is very important for me. That was the my decision making point. Could you tell me about the process how you became involved in the production? Nagasaki: A producer from Studio Bones told me to work with this anime, and then when I read the original manga I said yes, because it was very interesting. Okamura: For the producer side, while we were in discussion, we believed that we needed someone who could serve as a director and who had skills and experience to create an anime not just for otaku but also mass audiences. Then we came up with Nagasaki, who had successfully made great anime such as Gundam Build Fighters. Are there any characters whom you most identify with? Nagasaki: For me, it’s Deku. This is his hero’s story, but it’s not only about the hero. This can translate to any circumstance where you are working hard to achieve your goals. I always try hard to attain to my big goals, and I found a similar attitude in Deku, who is always trying to make that happen. The story is not just limited for children who dream about becoming heroes, but it’s for everyone who is working hard to make their dreams come true. Okamura: For me, it’s the girl characters. In this story, girls are not only supporting roles but are heroines. I feel this story is more modern that way: girls aren’t just side actors but are reaching their own goals. The girls even fight against the boys. Among the five boy characters, the girl is also a heroine and is trying to save the world. I want to grow old like Recovery Girl! Nagasaki: My own goal is to make each anime I make better than last one. I want more people to enjoy anime. I thought you were going to say “taking over the world” or something. Okamura: (laughs) But, our anime is watched by many people around the world. This is another way to say “taking over the world”, and he is probably trying to take over the world by the anime coming the U.S.
Is there anything you are looking forward to seeing besides the convention center in Los Angeles? Nagasaki: The atmosphere is pretty good, and I really like it. I think I don’t have enough time to sightsee this time but want to visit here again on a private trip. If I have time, I want to go Santa Monica, which is a different side of LA.